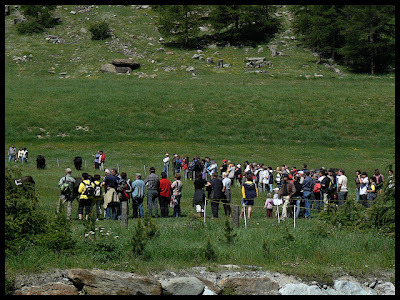 The spectators ringside. Note the families with little kids. 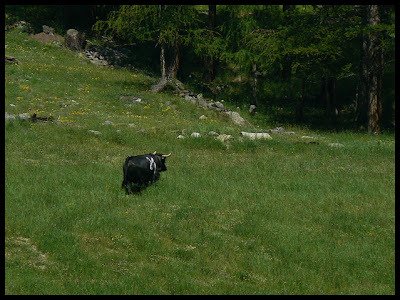 One seemed to be eager to get on with the business of going up to the mountain meadows. 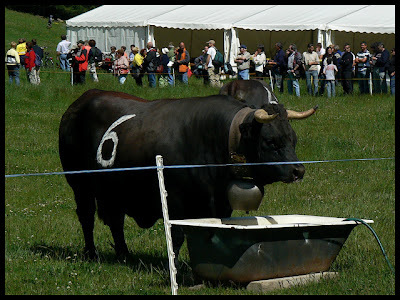 There was only this one water trough for the 30+ cows, which I thought was insufficient. The cow herders kept having to guard some of the ones taking a drink, to prevent a few other feisty ones from disturbing them while they were drinking. 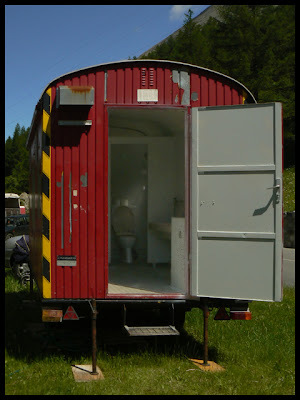 The toilet for the biped masses. 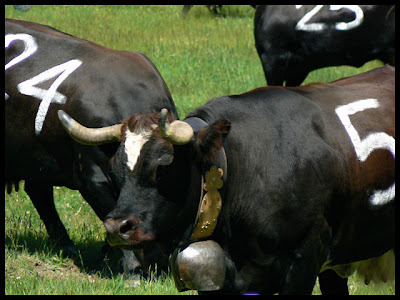 I am surprise a litlle because I did not know you have cow fighting in Switzerland ! I think people had a good time and I like the picture of the restromm ! Z May I ask you for something ? Do you come from America ? Do you like cow fighting ? You know in south of France we have Corridas. Some people like, the other ones no. I saw come corridas; one in Spain one in France. I have very mixed feelings on that subject. It is a nice shw but so cruel for el torro ! Claude: I lived in the US for many years. Um, I don't know about the corridas (is that the one generally known as Spanish bull-fighting? ), but since you mention that it is cruel for the bull, it is something completely different from this Valaisian thing and I know I wouldn't like it. Did you see the video clip? It is really just pushing that happens, like a tug of war in a way. Did you see how when one cow surrenders, she just runs off, and that's the end of the fight? The two might return to grazing in a second or two. I almost think a different name should be used for the one here, because of the association that people (including myself) have with the "animal fight" phrase. Z Yes corridas in bull fightings. I saw your video. It is not the same thing of course. I did not want to compare, that just reminds me bull fightings. If I undestand right, cow fighting is a soft play if I can say like that. Every animal shows its strong. Sorry but my english is not perfect.